How can you access the hidden jobs market? Reverse marketing recruitment at its finest. This job search book will help you become a Reverse Headhunter! The world of executive level job search has changed beyond all recognition in the last few years. 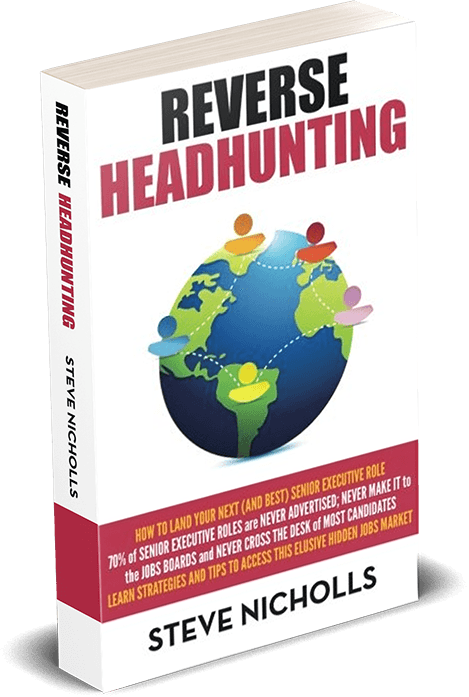 In his book Reverse Headhunting, owner of Career Coaching Consultancy Executive Connexions Ltd. Steve Nicholls shows job hunting executives how to access the best senior level roles; those that are unadvertised using reverse marketing recruitment techniques and finding the headhunters. by being a reverse headhunter. Research shows that 70% of the best jobs are to be found in this hidden jobs market which shows why its vital to be a reverse headhunter. “It’s vital in today’s ultra-competitive jobs market to change your thinking.” says Steve. “Being proactive and focusing on the hidden jobs market might seem daunting at first, but the rewards can be incredible”. Smart use of social media is one of the critical steps to success in tracking down these hidden roles, and in the reverse headhunting book Steve takes you step-by-step through easy to apply techniques, that if used consistently will transform the way that executive job search is carried out. Together with chapters on getting the CV / Resume optimised and sharpening up job interview skills, the reverse headhunter book also contains insights from executive headhunters, recruiters and marketers, which will give you many insights such as reverse marketing recruitment methods to give you an edge in your job search. Reverse Headhunting is available exclusively at Amazon in Paperback and Kindle versions. Order your copy today. Reverse Headhunting is now available as an audiobook from the following retailers. NOTE: We are not headhunters or recruiters. This page is for information purposes only. An executive headhunter works on behalf of the job seeker who is in search of an executive position. Our reverse headhunter book and services are a part of career management and our executive career coaching services including career coaching, executive outplacement, career change and many other circumstances. If you are in hunt of a certain role in the industry and need someone to seek for opportunities fit for that role, our reverse headhunting services will benefit you. Reverse headhunting is also used as an alternative term for executive search. It is a targeted exercise which is research-led. Our reverse services also extend to approaching appropriate candidates and pitching relevant opportunities to them with our knowledge of what head hunters are looking for. Even if the candidates are not seeking for jobs, they may consider transitioning. It works differently than a recruitment process. This process searches for executive professionals who are specifically fit for a particular role. Our job is to help you get headhunted by navigating the hidden jobs market and other sources to access the best headhunted roles. There are many ways by which you can benefit from reverse headhunting services as a candidate. We help you with tactics to uncover the hidden jobs market. If you have not been to an interview in a long time, you might be lacking confidence. Our services will help you to succeed so you are more than prepared. From improving your technical knowledge, to keeping updated with the latest interview trends, you can develop your skills efficiently. You will also get great tips to maximize your chances. Headhunters do not work with big groups. They focus on a selected group of highly motivated and potential candidates. As a candidate, you will get personal attention and guidance through our executive career coaching programmes. This will help you in overall development and increase your probability of getting your dream job. Headhunters have accrued knowledge about the hidden job markets and we have the knowledge that can get you jobs that you would generally not have access to. Several companies utilise reverse headhunting services in a discrete manner, especially when it concerns senior executive roles.